Thin Brick: by General Shale. I LOVE this product. It is such a great material to bring warmth and drama to any space. Thin brick is easy to install and so light weight that it can be used for many applications. I have seen several designers specifying this product for backsplashes and accent walls. It can also be used as flooring. Another great feature is its ability to work with almost any color scheme. Brick is full of many colors and General Shale carries several options to choose from. Even if the brick you select is mostly beige and you are using it with a grey palette, you can pair it with a gray mortar that will transform your brick into the perfect match. I have seen a lot of people using brick wall paper lately to try and achieve this look. Although, I have seen some really beautiful renditions of brick on wallcoverings, it can never give you the same effect as having the real product and the real texture. Thin brick is the perfect solution. The image below showcases the “Ironworks” thin brick by General Shale. It is my favorite shade they sell. I actually fell in love with it last year when I saw this photo in General Shale’s annual calendar. 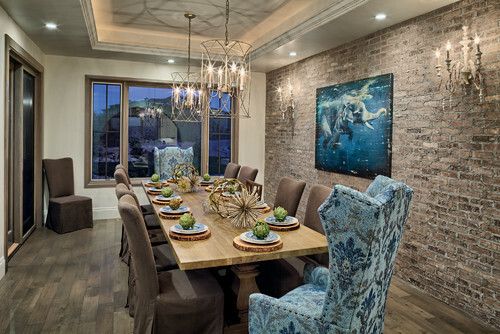 I thought that it really tied this dining room together and gave it just the right amount of drama! 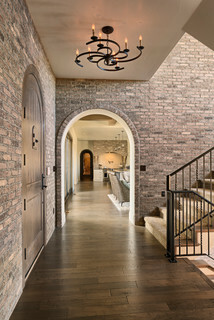 This home is the Colorado Home of the Year – to see more images click on the photo to follow the link to the General Shale Houzz page. Adorne Under Cabinet Systems: by Legrand. Legrand has everything when it comes to the electrical you are running in your next renovation or new construction project. However, the line that completely blew me away is the Adorne under cabinet system. Backsplashes have quickly become one of the kitchens most important features. Originally they were added just for function; now they set the tone for the entire space. However, code requires so many outlets in a kitchen. 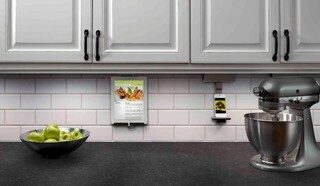 This means that inside of our beautiful backsplashes, we have several outlets distracting our view. With the Adorne line from LeGrand, you can hide all of these outlets and add in other components that help make life in the kitchen a little easier. The image above shows a great before and after shot of the what all can be hidden up under the cabinets. The outlets are obviously under there but you also have an iPad docking station that is plugged into a USB port charging while being used to display a recipe. 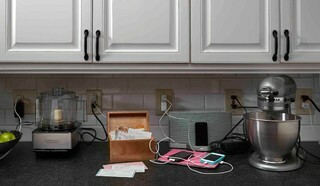 There is also an IPhone docked and charging while playing music through a blue tooth speaker hidden under the cabinets. 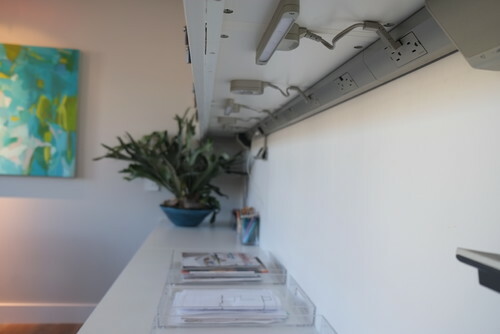 The Adorne system allows you to hide everything from under cabinet lighting & USB ports to iPad docking stations & blue tooth speakers. This makes the kitchen an even more functional space without sacrificing the look you love. The best part is that this system is not an outrageous expense! The image below shows you what this system looks like when viewing it from underneath. Click on the image to view the Legrand Houzz page for more inspiration! 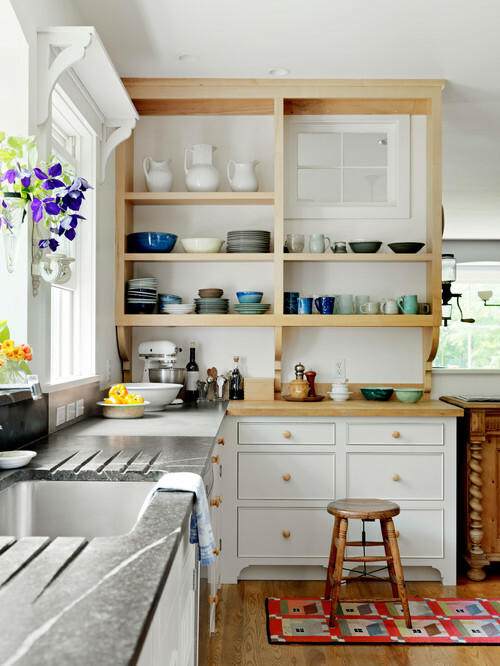 Soapstone Countertops : The most popular countertops seen in our area these days are granite and quartz. 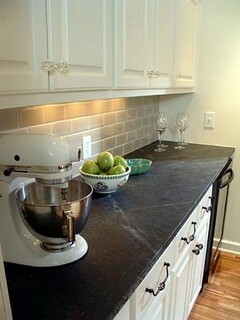 However, a really awesome countertop material used prominently in Virginia is soapstone. This product is great! I first heard about it through my friend, Hannah with Hygge Design Co. (see her page by clicking the blue button box at the end of this post). She was doing design work in the Shenandoah Valley in Virginia and came to know this product very well during her time there. moisture evaporates. Then the countertop is as good as new again! The maintenance on these countertops is so low and only looks better over time – not worse. With heavy use it will get small nicks and scratches that wear very well. However, if the scratches bother you, then you can easily buff them out with a fine sandpaper. Another exciting benefit to using soapstone is that it is easy to carve into. I am currently working a project where my client wants to use soapstone and carve in an integrated drain board. It is such unique and functional look and I cannot wait to be able to share that with y’all on my page! I hope this post was helpful to you and has inspired you to try something new for your next project!! ​Let me know if there is any material you have enjoyed working with!